Sustainable. Organic. Farm-to-Table. These terms describe a growing trend across the country – Buy Local, Eat Local, Hire Local. As a college professor in a large metropolitan area, I work with dozens of Fortune 500 companies in the area of Analytics and Data Science. All of these companies (as well as smaller organizations) are experiencing the same issues related to finding qualified analytical talent. If (and that is a big “if”) they can find the talent on the open market, they lament that (1) the talent is very expensive and (2) they are difficult to retain, particularly if the talent is “imported” from outside the region. A few years ago, companies did not have many options for recruiting analytical talent – primarily because few universities had programs teaching the material and skills necessary to be an effective data scientist. However, this is no longer the case. Universities across the country should be applauded for responding to the needs of the marketplace in meaningful ways and pivoting their curriculums to meet the insatiable demand for deep analytical skills. There are now over a hundred different programs across the country at the undergraduate, master’s and Ph.D. levels in analytics and data science. These programs take on lots of different “flavors” – some are housed in the College of Science, some are housed in the College of Health, some are in the College of Business, and some are interdisciplinary. Regionally, these schools are well dispersed from New Hampshire, to Georgia, to Texas to California – every region of the country now has a portfolio of universities that offer strong programs in Analytics and Data Science. Allowing the professor to use real data (scrubbed of any proprietary or confidential information) from a local company (typically well-known to the students) with specific challenges to develop material and in-class applications is substantively more meaningful than the more generic, often synthetic data that is more broadly available – and less meaningful. By working with real data in context with specifically articulated objectives, the engagement improves the relevance and the quality of the material that is taught in the classroom, which will then translate into graduates with more relevant skills (who will then donate back to their alma maters). In addition, it provides the organization providing the data and the project with a great way to screen candidates as well as potentially receive valuable insights into their data. (2) Boosts the Local Economy. The university where I work is public – we are funded by the taxpayers of the state of Georgia. This means that the taxpayers of our state are “investing” in our institution with the expectation that they will receive a return on their investment. This return is characterized, at least in part, by graduates who are prepared to contribute to the local economy. 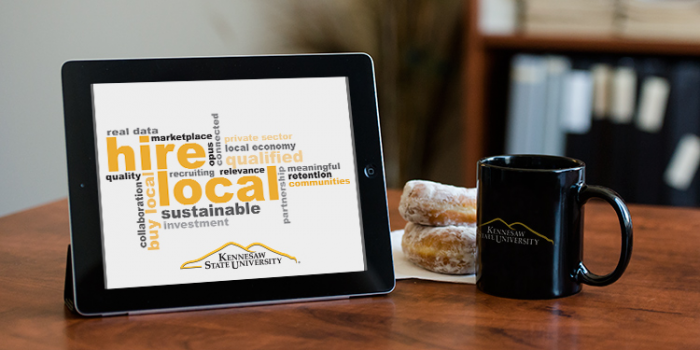 An important way that our university attempts to contribute to the taxpayers’ return on investment is through a “farm-to-table” approach to analytical talent with local companies. Specifically, we collaborate with the private sector to understand their hiring needs – not just now, but one to five years in the future. We then work with these companies to ensure that the skills and topics that we are teaching in the classroom are aligned with their hiring needs. We also work to identify and partner students with specific interests and skills with local companies early in their academic career through internships and co-ops. This process allows companies to collaborate to effectively “grow” the necessary talent over time – increasing the likelihood of retention relative to “exotic” talent imports from faraway places like Boston or San Francisco. (3) Builds More Connected Communities. There was a movie in 1995 called “Mr. Holland’s Opus.” In that movie, the music teacher – Mr. Holland – accepted a “temporary” position as a teacher to pay his rent when his real intent was to pen a musical opus. Thirty years later, as he is retiring from his teaching position, and lamenting his unwritten musical compositions, he recognizes that his “opus” was really the community of thousands of students, spanning two generations, whom he had taught. Our analytics programs were formally launched in 2006. Most of our students have accepted positions locally/regionally. The implications of this are far reaching – these alumni are quick to come back for our analytics events as judges, they are likely to come to the university to recruit for positions for which they are now hiring, and they are frequently invited to speak in the classroom or at “career nights.” This connection with recent alumni is meaningful to the current students – they recognize through these alumni that they are part of a community. These events are also very fulfilling for the faculty – the community of alumni becomes sort of our own analytics “opus” (although I think when I have someone come to me and say “You taught my father,” that becomes my signal to retire). As analytics programs continue to proliferate across every region of the country, organizations looking to recruit analytical talent (and that would be all organizations), have a lot of variety from which to choose. The good news is that much of the new talent can be sourced locally – creating a sustainable, organic, farm-to-table movement that benefits everybody. Sponsored article written by Jennifer Priestley, Ph.D.